Seattle Seahawks offensive lineman and former WKU Hilltopper George Fant is auctioning off a pair of Special Olympics Kentucky-themed, game-worn cleats with the funds raised to benefit our athletes. Fant, a Bowling Green native, wore the cleats on Sunday, Dec. 2, against the San Francisco 49ers as part of the NFL’s “My Cleats My Cause” promotion, in which every NFL player had the option of choosing a cause and wearing custom-made cleats in support. 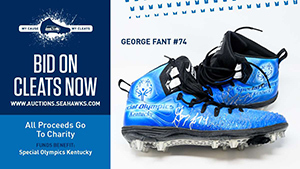 Fant’s cleats will be up for auction on the Seahawk’s Web site through 8 pm on Dec. 12. Fant chose Special Olympics Kentucky because of a lifelong association with people with intellectual disabilities. 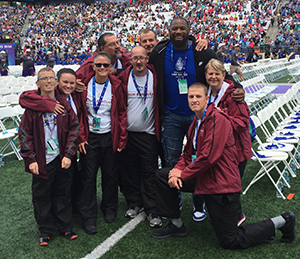 WKU alum and current Seattle Seahawk George Fant joined Team Kentucky during the Opening Ceremonies at the 2018 Special Olympics USA Games in Seattle. The cleats aren’t Fant’s first association with Special Olympics Kentucky. He served as an official ambassador for the 2018 Special Olympics USA Games that were held in Seattle in July. He marched into the University of Washington’s Husky Stadium with the Team Kentucky delegation at the Games’ Opening Ceremonies. Fant, who was recruited to play basketball at Western Kentucky, played only one year of football for the Hilltoppers. After starring for the WKU basketball team, Fant used his fifth year of eligibility to play football for the first time, joining the team as a tight end. He appeared in two games and had one reception, but impressed NFL scouts at WKU’s Pro Day following the season. He joined the Seahawks as an undrafted free agent for the 2016 season and worked his way into the starting lineup for 10 games. Injured in the preseason in 2017, Fant returned for the 2018 season, appearing in all of the Seahawks’ games and starting three through Week 12. We are truly thankful to Fant for recognizing our athletes in this way. We’re honored that he chose to represent Special Olympics Kentucky during the My Cleats My Cause promotion.